One of the questions most asked by Christian parents on forums is: What Bible should I get my child? Most of us start with Bible story books, and story book Bibles, re-tellings of Bible stories. They make the Bible more accessible to our children and often feature great illustrations, such as those by Jago in the Jesus Bible Storybook. However, any re-telling is going to reflect the theology of the person doing the re-telling. However we try, how we view God changes how we tell stories. Let me give you an example I came across recently. We were reading a children’s storybook Bible which features lots of the less-told stories (which I think is great) and so we were reading about the building of the Tabernacle. Now, firstly, the author decided to use the word ‘church’ for Tabernacle, which I find a bit problematic. It was only in the first paragraph or so, but I feel it places a word completely out of context, as it wasn’t for thousands of years that the word ‘church’ was used in history. I think it’s easy enough for a child to understand the Tabernacle was a place to meet with God, and if necessary, they could have added, ‘like we meet God at church’. It also feeds in to the whole concept of church being the building rather than the people. However, I told my children I didn’t think this was a good word to use and just used Tabernacle instead. So far, so good. 30 Then Moses said to the Israelites, ‘See, the Lord has chosen Bezalel son of Uri, the son of Hur, of the tribe of Judah, 31 and he has filled him with the Spirit of God, with wisdom, with understanding, with knowledge and with all kinds of skills – 32 to make artistic designs for work in gold, silver and bronze, 33 to cut and set stones, to work in wood and to engage in all kinds of artistic crafts. 34 And he has given both him and Oholiab son of Ahisamak, of the tribe of Dan, the ability to teach others. 35 He has filled them with skill to do all kinds of work as engravers, designers, embroiderers in blue, purple and scarlet yarn and fine linen, and weavers – all of them skilled workers and designers. I don’t know about you, but to me this re-telling suggests that people employed in the work of running church (vicars, ministers, priests etc) have better access to God’s and are more filled with His Spirit than the rest of the people. It also suggests that those who are extraordinarily gifted in creating beautiful things are second rate. For me this is the opposite of what the text says: I felt that Moses is elevating the gifts and work of Bezalel and Oholiab in front of the people, and giving them confidence to follow their leading in creating a beautiful place in which to meet with God. What did I do? I told my children I didn’t agree with this bit, and explained why. 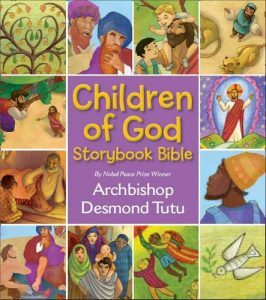 I realise that no children’s storybook Bible is going to ‘agree’ with my theology, and as I hope my understanding of God continues to deepen as I discover more of God, I would hope any book which captures everything I think today will not do so in ten years time. With this in mind, I have opted to have a variety of children’s storybook Bibles so that we an read and explore different people’s perspectives on Bible stories, and hopefully in doing so, we will discover more of God together.